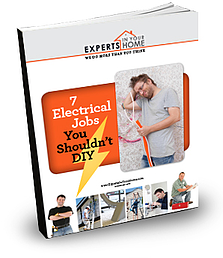 Get your free "7 Electrical Jobs You Shouldn't DIY" eBook. As homeowners, we are constantly doing projects around the house. You may enjoy these DIY projects or you may be doing them yourself to cut down on household expenses. Making sure your electrical system will not cause future problems. These tips will help you know which electrical jobs should be left to the pros so you can sleep at night.